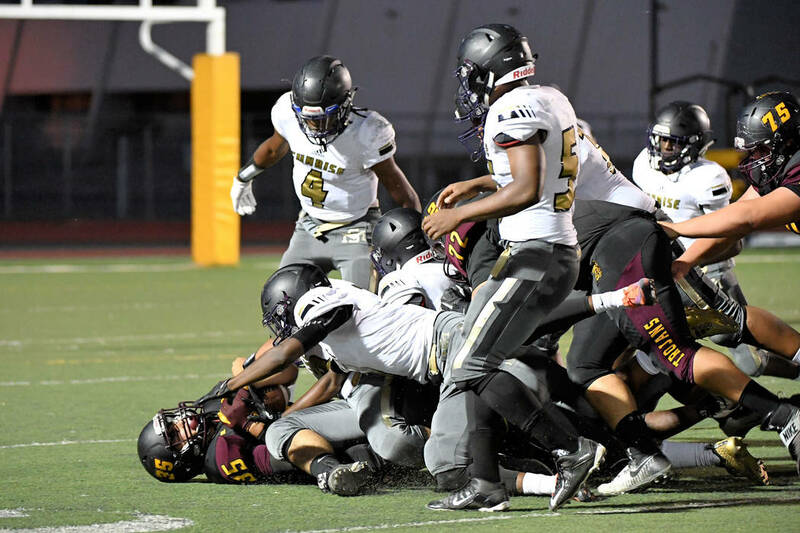 Friday night’s 42-14 homecoming victory over Sunrise Mountain was a textbook example of what Pahrump Valley football coach Joe Clayton wants to do. Peter Davis/Special to the Pahrump Valley Times Quarterback Dylan Wright hands off to Nico Velazquez during Pahrump Valley's homecoming victory over Sunrise Mountain on Friday night. Peter Davis/Special to the Pahrump Valley Times It takes a village to bring down Pahrump Valley senior Nico Velazquez, who has rushed for more than 500 yards in three games this season. Peter Davis/Special to the Pahrump Valley Times Pahrump Valley center Jakob Landis prepares to snap the ball to quarterback Dylan Wright during the second half of Friday night's 42-14 win over Sunrise Mountain in Pahrump. 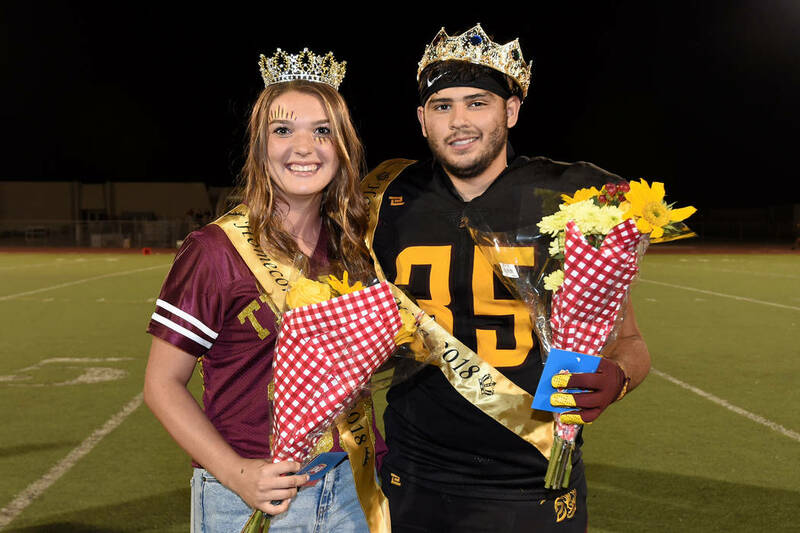 Peter Davis/Special to the Pahrump Valley Times The football team's victory was no upset, and neither was the naming of Pahrump Valley's homecoming queen and king: Halie Souza and Nico Velazquez, who were introduced at halftime of the Trojans' 42-14 win over Sunrise Mountain. Peter Davis/Special to the Pahrump Valley Times Pahrump Valley students get into the spirit of the Trojans' homecoming game against Sunrise Mountain on Friday night. Clayton’s philosophy is based on an offense that grinds out yardage and chews up the clock, limiting possessions for the more athletic teams they face. An offense that runs the ball 40 times for 365 yards, as the Trojans did Friday night, is doing exactly that. And Sunrise Mountain had the weapons to make the big plays opposing coaches fear. Senior quarterback Tyree Hayes threw for 220 yards, and junior Link Rhodes made seven catches for 140 yards and a touchdown. But the Miners’ offense only found the end zone once — the other touchdown was on a fumble return off a mishandled snap — and that was during a running clock against a lot of Pahrump Valley backups in the final minutes. Still, the fact that Hayes and Rhodes twice hooked up for gains of more than 40 yards shows why Clayton feels the Trojans need to play keep-away football. And while their offense might seem like basic, almost simple, football, that doesn’t mean it’s easy. And the lead allowed the Trojans to spread carries around. In addition to Nico Velazquez’s 109 yards and Casey Flennory’s 94, Joey Koenig, Anthony Peralta, Andrew Avena, Antonio Margiotta, Dylan Grossell and Donnie Miller each had carries, totaling 20 for 162 yards. Ponder that: Taking out the Trojans’ top two rushers for the game, they still averaged more than 8 yards per carry. Even the best combination of power and speed in the backfield needs room to run, and Clayton has high praise for his offensive line. Clayton could rave about starters Sproul, Zack Trieb, Brandon Bunker, Armani McGhee and Jakob Landis for hours, but he did have something specific to say about Landis. The bottom line is almost 1,000 yards rushing for the Trojans in just three games, with Velazquez already topping the 500-yard mark. 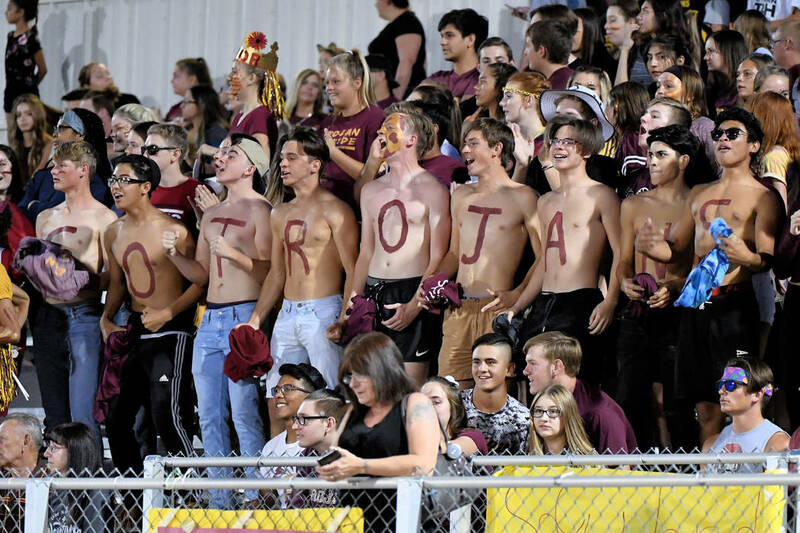 There wasn’t much to complain about from the Trojans’ perspective Friday night — a mishandled snap returned for a Sunrise Mountain touchdown, a few big pass plays given up, a couple of unnecessary penalties — but one potential issue was senior quarterback Tyler Floyd missing the second half. Although it means little medically, Floyd seemed to be in good spirits on the sidelines after the injury, following the action, conversing with backup Dylan Wright and chatting easily with teammates. 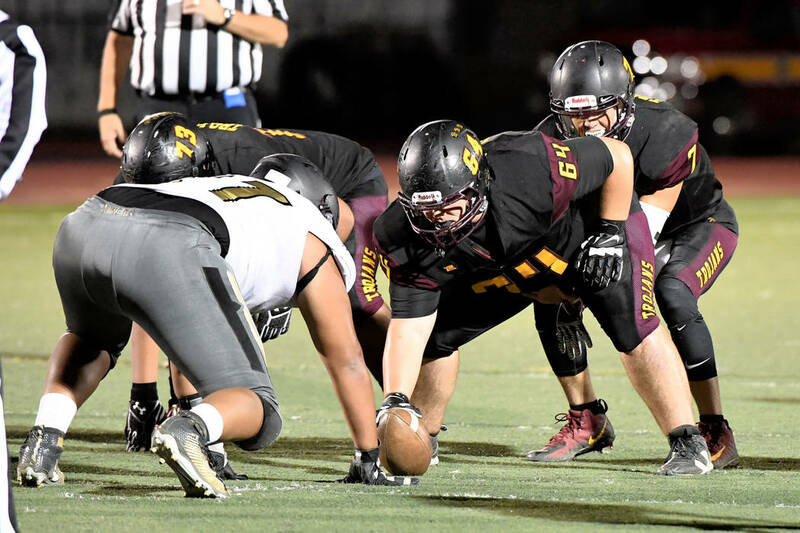 If Floyd can’t go, it won’t change the offense much, but in a tight game the poise he showed during Pahrump Valley’s comeback attempt against Virgin Valley might be missed. Not that it looked that way Friday night. Wright seemed perfectly at ease playing traffic cop in the Trojans’ jet offense, with no mistakes to show for his efforts. “He hasn’t had that many reps with us,” Clayton said. “We had just brought him on varsity to play safety. We’ve been so fortunate with not having a true backup, and we knew we could always pull our JV quarterback up if somebody was to get hurt in the varsity game. But Clayton has a great deal of confidence in Wright, and much of that comes from Wright’s successful freshman year on the wrestling mats. Wright, the Class 3A Southern Region runner-up at 145 pounds, showed his mettle during the Class 3A state championships in February, when he bounced back from a loss to three-time state champion Anthony Chavez of Spring Creek in the semifinals to record a dominant technical fall over Josh Abbott of Virgin Valley to claim third place. “I’m a true believer in mental toughness, and it doesn’t get any more mentally tough than wrestling,” Clayton said. “You’re talking about a sophomore who’s a true, solid wrestler. We had no doubt mentally he would be ready. While the varsity Trojans are a few points away from being 3-0, the junior varsity Trojans really are 3-0. 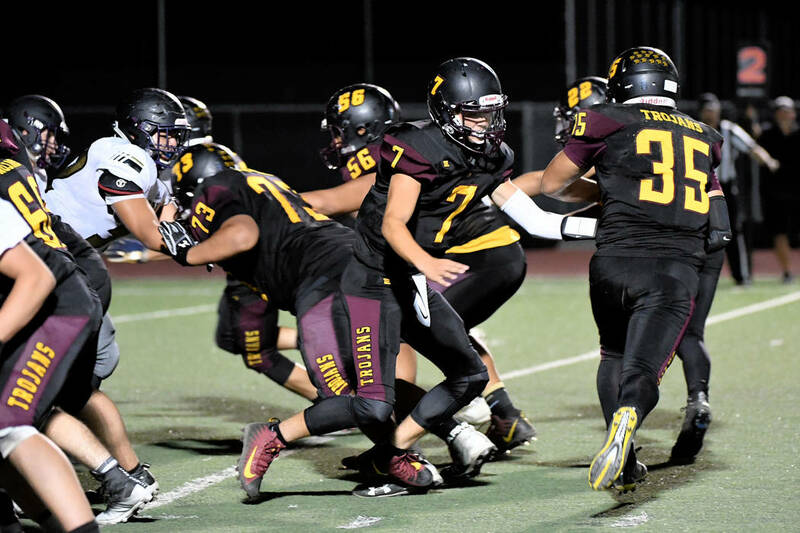 They also had an easy time against Sunrise Mountain, rolling to a 40-6 victory Thursday night in Pahrump. This was after a 22-21 win over Lowry as the Buckaroos missed a last-minute field goal and an 18-14 win over Virgin Valley. Naturally, Clayton is pleased the younger players are learning the Trojan way of doing things.